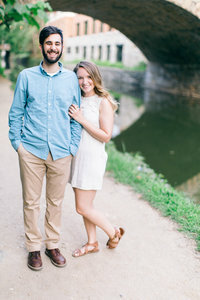 Ben and Colby’s engagement session at the ever beautiful Rust Manor House in Leesburg, VA was SO much fun! I was so glad Virginia gave us some surprisingly warm weather around Christmas time for these two West Coast residents. It was such a special time talking about their upcoming marriage and their love story beginning all the way back in college. We are so grateful to have documented this sweet season for them, and loved to share a bit about them in their own words! 1) Where & when did you meet? 2) What would be your dream date night? Can I describe a full dream date day? 🙂 Take our dog Gunner on a fun hike in Malibu, watch an Alabama football game somewhere fun and see them win, dinner some place cool that is new and we don’t usually treat ourselves to, followed with wine and a movie! 3) How did Ben propose? Long story short, he surprised me over the 4th of July week in Hilton Head Island, SC on a lake in the beautiful resort we were staying in. Then the next surprise was a room alone playing all of our favorite songs, roses and a bottle of champagne. Then next surprise was a dinner at the community center where it was completely decorated for us and NEXT… one by one my mom, step dad, dad, step mom, step sister, and 3 best friends all walked out from the back and I had no idea that they were going to be there!!! And, we got to spend the entire week at the beach all together and celebrating. Best time of my life! 4) What are you most excited about for your wedding day? Celebrating and having fun with all of our favorite people. I want everyone to have the best time ever! Enjoy some favorites of our time at Rust Manor House!